The EUR/USD pair has completed an alternative rising leg. At the moment the market is trading in a descending wave. We await for the level 1.1634 to be hit. Another possible scenario is an upward move towards 1.1673 (at least). 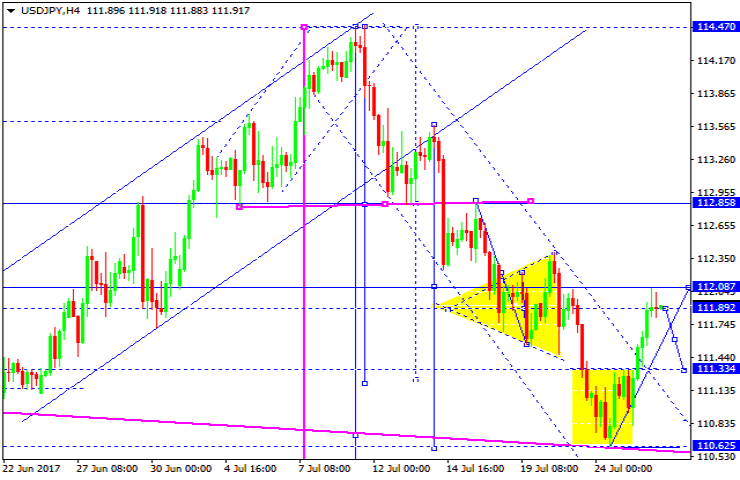 Then the downtrend can be extended to bring the pair to 1.1600 level. The first target is 1.1500. 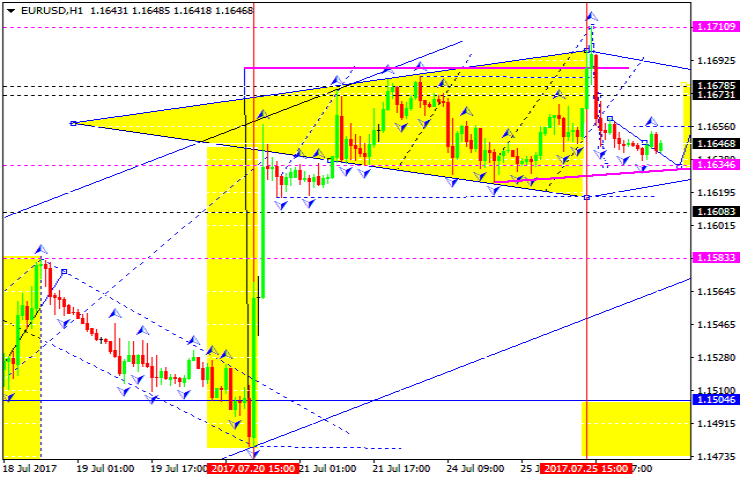 The GBP/USD pair keeps developing its consolidation range on top of the rising structure. If this range is broken through from top downwards, a possible downward move towards 1.2950 is possible. The 1.2950 level stands in the middle of the 3rd descending wave. 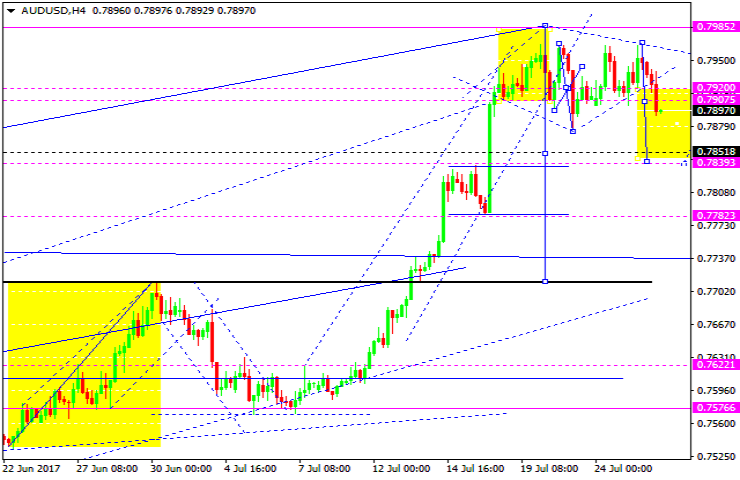 The local target of its wave is the 1.2812 level. The USD/CHF pair has broken through the consolidation range from bottom upwards and completed the first target of this rise. At the moment the market is trading within a tight consolidation range. 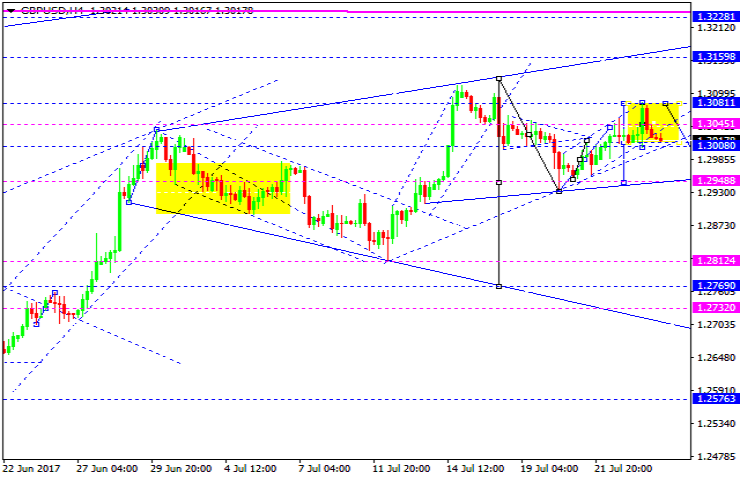 If this one is broken from bottom upwards, the trend can possibly move higher towards 0.9595. If the range is broken from top downwards, a correction move towards 0.9490 will be possible. The USD/JPY pair has broken through the consolidation range from bottom upwards. The previously calculated leg has been completed. For today we'd consider a possible downward towards 111.33 level. Practically, the pair can form a new consolidation range. If it is broken from bottom upwards, a rise towards 112.85 is possible. 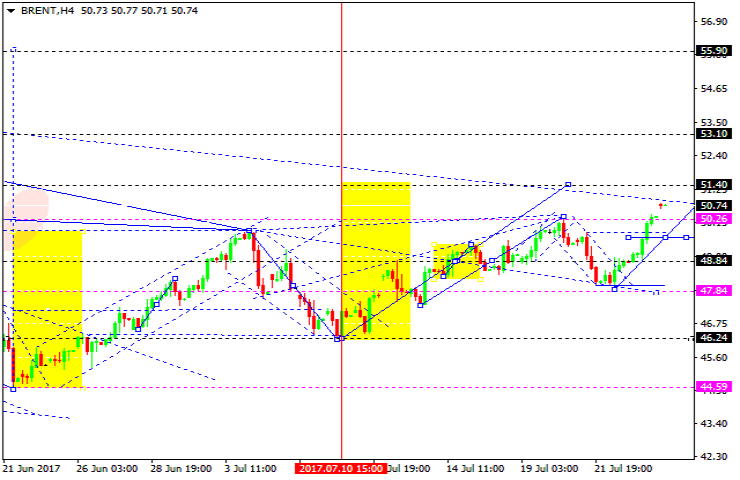 In case the price breaks this range from top downwards, the pair can move lower towards 109.30. The AUD/USD pair is trading under pressure and declining. The 0.7839 level can be hit soon. 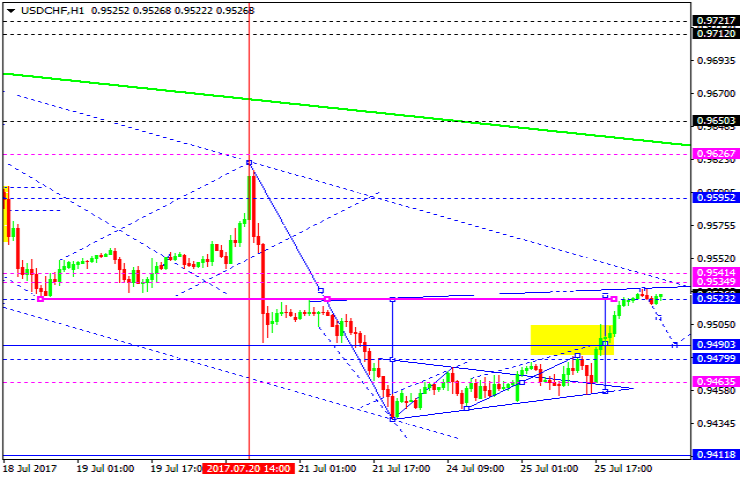 Another possible scenario is a rising leg towards 0.7920. Then the pair can move lower towards 0.7700. The USD/RUB pair keeps developing its consolidation range on top of the rising structure. For today we'd consider a downwards move towards 58.80. 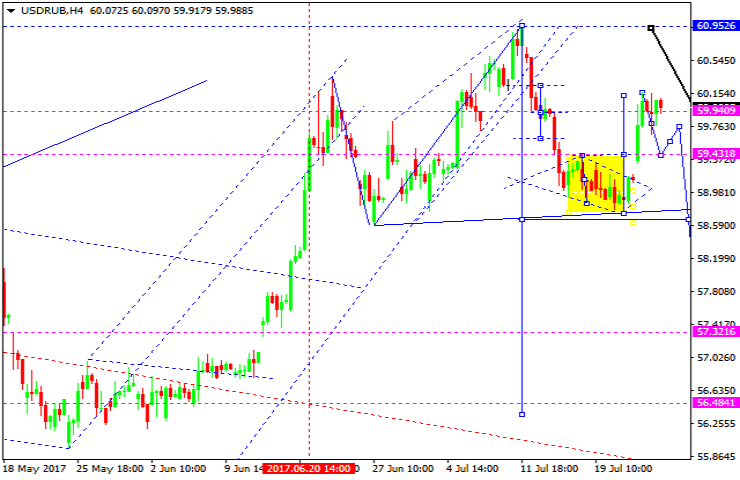 If this one is broken through, a descending move to 57.30 can occur. The target is the local one. 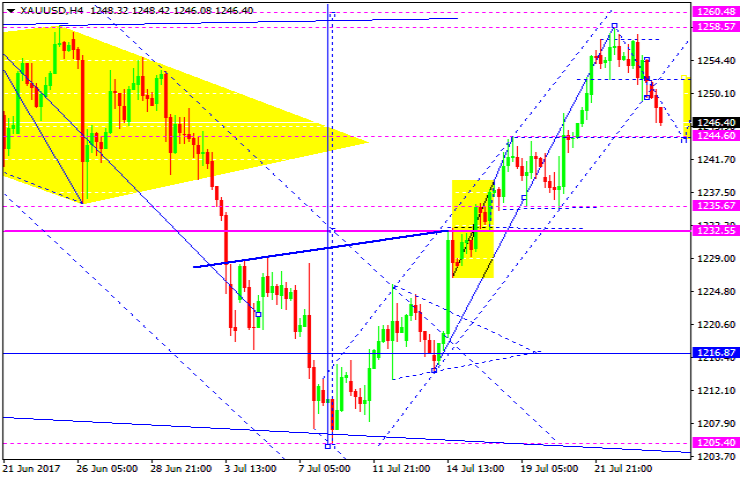 Gold has broken its consolidation range from top downwards. We await a downward move towards 1244.80. Another possible scenario is a rise towards 1250.00. A breakout of the range from bottom upwards can trigger a rise towards 1260.00 level. If the lower edge of the range is broken, a correction towards 1232.00 can occur. Oil is trading higher under pressure. The 51.40 level can be hit soon. Another option for the pair is a correction move towards 48.84. The pair can then rise to reach 53.10 level.